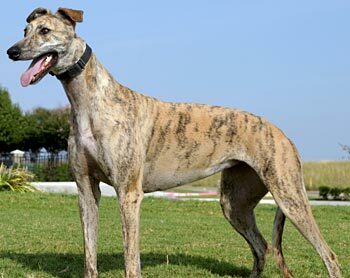 Missie, aka Kiowa LL Cool, is a 2-year-old brindle female born June 25, 2007. Her sire is WW Apple Jax, and her dam is Flying Larned. 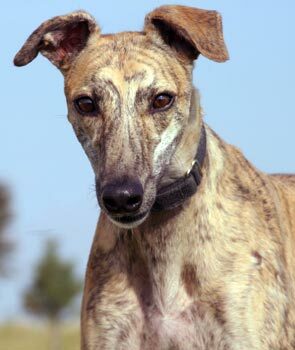 Missie was found as a stray by Ft. Worth Animal Control, and GALT was notified by Ginger Leach. Missie has 4 races to her credit, all at Wheeling Downs, WV, in October and November of 2008. How she arrived in the Ft. Worth area is a mystery. 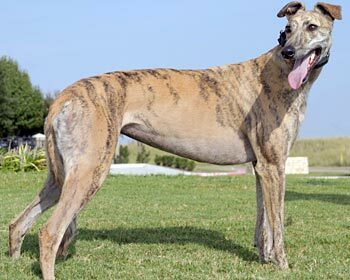 Missie was very, very thin when she came to GALT, but fortunately all her blood work was relatively normal. After she gained weight, she completed all her medical procedures and now is ready to find her forever home. Missie’s cat test: Missie went from moderately interested, to mildly interested to whatever with the cat. She got enough sniffs to satisfy her curiosity, apparently. She was allowed off-leash and without muzzle with plenty of time to change her mind. Although she passed her cat test, we always advise very close supervision when introducing a Greyhound to a home with cats.